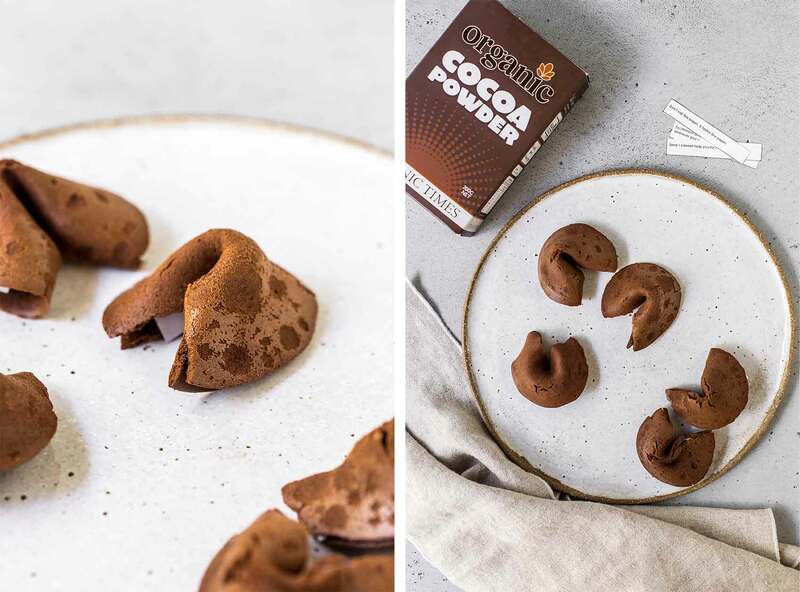 Add a little Chinese New Year spirit to your home with these homemade Chocolate Fortune Cookies. Made with organic chocolate these resembles a classic sweet chocolate cookie with a delicate texture when opened. Enjoy any time of the year! Printable Fortune Cookies Sayings here. Pre-heat oven to 190ºC (375ºF). Line a baking tray with a non-stick silicone mat or a sheet of baking paper. Place a mug on your work bench ready to form fortune cookies. In a double boiler over low-medium heat, melt dark chocolate drops and butter together until smooth. Once melted, remove from heat and set aside to cool. Using a stand mixer or a mixing bowl with a hand beater, add eggs and salt to the bowl. Beat for approx. 30 seconds until thick and pale. Add sugar to the eggs and beat for a further 30 seconds until sugar has dissolved. Pour in melted chocolate mixture and beat until well combined. Add flour and cocoa powder, beat until just combined, ensuring not to over-beat. Pick up 1 tablespoon worth of the batter and dollop onto lined tray. Using a teaspoon, spread out into a larger circle, about the size of a regular cookie. Repeat above method one more time, creating only two circles on lined tray. Working two at a time will allow you to form each fortune cookie before they break. Place tray in oven and bake for 6-7 minutes or until the edges begin to brown slightly and the surface of the cookies have just firmed up. Remove from oven and working quickly whilst cookies are still hot, slip a fortune paper on to the middle of one cookie and fold over one side, creating a half circle and the fortune enclosed in the middle. Place formed cookies into a cupcake/muffin tin this will allow them to hold their shape whilst they cool. Store in an airtight container, in the pantry.